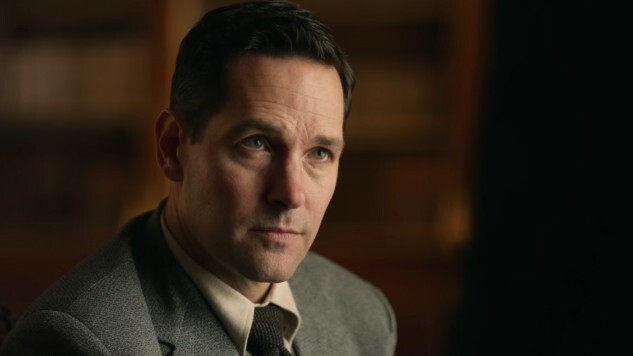 Paul Rudd—from Avenger to spy. The comedy vet is increasing his range with a new WWII drama. The Catcher Was a Spy debuted at Sundance this year, was picked up by IFC for distribution, and will hit theaters and VOD on June 22. Based on a true story, the film follows Major League Baseball player and Ivy League graduate Morris “Moe” Berg (Rudd), who is recruited into the Office of Strategic Services (or O.S.S.) due to the fact that he can speak seven languages. His task is to help the U.S. defeat Nazi Germany before they can build an atomic bomb. The trailer shows Rudd in this non-comedic character and at first, it seems a little odd. Of course, Rudd has played some dramatic characters before, despite not being the best known for those roles. We forget one of his earlier films was as the wounded army vet and boyfriend to Charlize Theron in The Cider House Rules, and he also took on a dramatic role in The Perks of Being a Wallflower. This could be a good turn for Rudd, who definitely seems up to the task. He can be seen in the forthcoming Ant-Man and the Wasp, and will return next summer for Avengers 4 despite being absent for Infinity War. The Catcher Was a Spy, directed by Ben Lewin (Please Stand By), also stars Mark Strong (Sherlock Holmes, Zero Dark Thirty), Sienna Miller (The Lost City of Z, American Sniper), Jeff Daniels (The Martian, Pleasantville), Guy Pearce (Memento, Prometheus), Connie Nielsen (Gladiator, Wonder Woman), Tom Wilkinson (Michael Clayton, Denial) and Paul Giamatti (Sideways, Cinderella Man). See the first trailer below.